I’ve been struggling with a serious case of envy for the past couple of weeks. Every few months the green-eyed monster rears its ugly head. The last time I experienced strong feelings of jealousy was back in March when I turned 33. I think it would be easier to handle my envy if it was directed towards celebrities. I mean, don’t we all wish we were rich and famous? Then I could remind myself that starlets are few and far between and that the chances of any talented actress/musician/model getting a big break are slim. But I’m not jealous of celebrities (at least not today). I’m jealous of you. Yes, you. My peers. Ladies with whom I have more in common than Oscar or Grammy winners. Other young women and moms who share their lives via social media. This time, however, I’m not solely jealous of your blog’s success. I’m envious of superficial things — where you live, what you wear, the fact that your hair cooperates in humid weather — rather than, say, your acting ability or vocal prowess. For example, I’m jealous that you live on the coast and can take weekend trips to the beach. I’m jealous that you have weekly coffee dates with friends and frequent date nights with your husband. I’m jealous that you wear shoes my long, narrow feet don’t fit into. I’ve been dealing with these types of complicated emotions long enough to understand that they stem from being discontented with aspects of my own life. I also know that the pictures you share on Instagram and the stories you tell on your blogs don’t paint the whole picture of who you are. Although I make it a point to be open and honest on Bunny & Dolly (case in point: this blog post), there are still things I choose not to share. Personal matters that only those closest to me know. And I need to remember that, surely, you do the same. Mariah designed this month’s Desktop Designs with a quote I chose to remind myself that your life is (probably) not as perfect as it may appear to me. That you have struggles and bad days and regrets. That, like me, you’re not sharing all of the really private, really ugly things. And that I make assumptions about your life because I don’t know the whole story. Unless your life really is that amazing, in which case, I should stop reading your blog. Download this month’s desktop wallpaper here! Desktop Designs is an on-going collaboration between Bunny & Dolly and Oh, What Love. Click here to view all past desktop wallpapers. I had never heard that quote before, but I instantly found meaning in it. Actually, I found it to have several meanings. On a superficial level, I interpret Lilly’s quote as instructions on how to dress: If your days are dark and dreary — if it’s overcast or rainy — wear something bright and cheerful. Spring is a season of renewal and new beginnings. The grass is growing, flowers are blooming, and sunshine warms the air around us. A temperate spring day begs for color, from ladylike pastels to energetic neon. Yet when the weather is less than ideal, I find it hard to part with wintery shades of blue, black, grey, or brown. How about you? I’ve always admired girls who flaunt florals in the snow and white jeans in the rain. (Although I do not approve of wearing open-toed shoes when it’s only 50-degrees outside!) Obviously, they are dressing for themselves, not for the weather. I should start doing the same. On a deeper level, Lilly’s quote fills me with optimism: If your days feel dark and dreary — if you’re sad or depressed — have hope that tomorrow will offer you a fresh start. No matter how challenging today may be, tomorrow is a new beginning. There is comfort in knowing that change is on the horizon. Desktop Designs is an on-going collaboration between Bunny & Dolly and Oh, What Love. P.S. — Download past Desktop Designs here. This month’s desktop wallpaper designed by Mariah from Oh, What Love Studios was inspired by a line from the Dowager Countess on “Downton Abbey.” When Maggie Smith’s character uttered those brilliant words, her question immediately resonated with me. 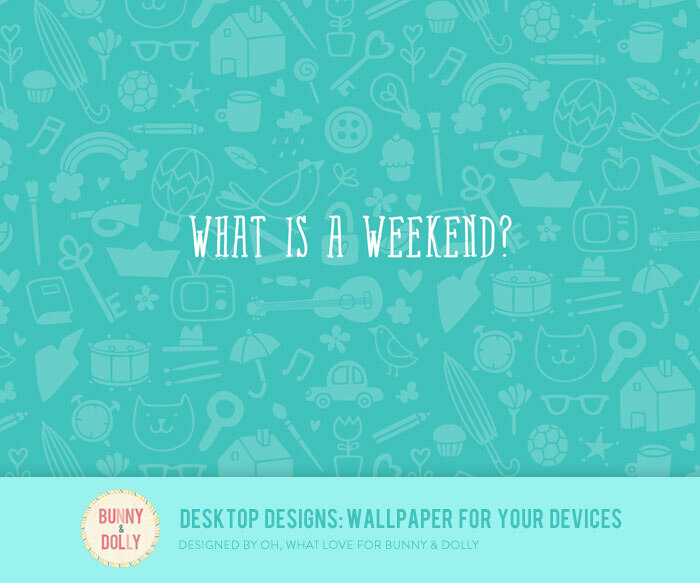 What is a weekend? Is it a time to slow down from the hectic nature of the work-week or an opportunity to cross off as many items as possible from your to-do list? JB and I have always been expert dawdlers, and when it was just the two of us, we gave ourselves permission to move at a turtle’s pace on Saturdays and Sundays. It wasn’t uncommon for us to still be in our pajamas midday (or later!) if we didn’t have anything on the calendar. Why get dressed if you have no place to go? Plus, weekends were our chance to recover from the demands of the previous five days. Like most working adults, Saturday could never come quickly enough. Then Levi was born, and as any new parent can attest, it’s hard to relax when there’s a baby in the house — no matter the day of the week. Infants on three-hour sleep/feed/play schedules leave little time for their parents (especially breastfeeding moms) to take a breather, and toddlers require near-constant supervision. If you’re lucky, your one-and-a-half year old will nap for two hours or longer, but then you have to choose between putting up your feet or being productive. Before Levi began attending Montessori for three hours each morning, when we were on the same schedule seven days a week, I frequently lost track of time. Mondays felt like Thursdays, and Thursdays felt like Sundays. The only way to differentiate between days was by what was on primetime TV. Now there is a clearer distinction between the work week and weekends: Levi is home all day. And I know this sounds awful, but I don’t look forward to Saturdays and Sundays in the same way I became a mom. They are no longer days dedicated to relaxation and slowing down; if anything, they are crazier than weekdays because I don’t have mornings to myself like I do when he is at Montessori. In addition, lounging around the house in our pajamas until lunchtime is now a source of stress instead of enjoyment. I feel guilty if I’m not providing Levi with structured activities all day long, like engaging him during playtime or getting him out of the house for fresh air and early morning errands. (Too bad we’re not morning people!) What I’d really like to do, however, plop him in front of the TV for an hour (or longer…) while I sprawl on the couch to read a book or magazine. How have your weekends changed now that you are a parent? Is it OK to be lazy every once in a while? Do you allow your child to watch a little bit more TV than usual or to wear his pajamas all day long on the weekend? Where do you draw the line between relaxation and dawdling? PS: A Downton Abbey-inspired tote bag! PPS: If you like what you see, please leave a comment below! 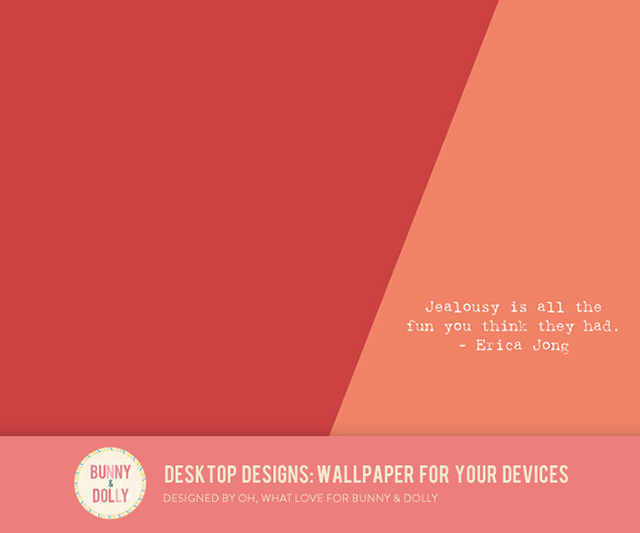 I’m so excited to share the second installment of Desktop Designs! 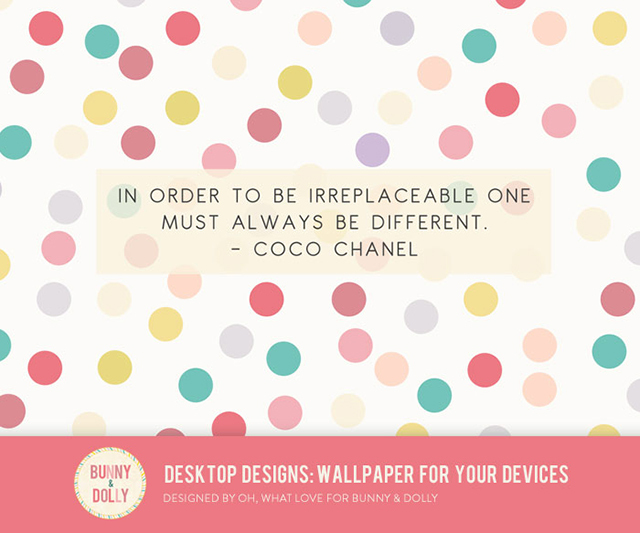 Mariah totally nailed this month’s wallpaper design, which features a quote from Coco Chanel: “In order to be irreplaceable one must always be different.” Not only are polka dots tons of fun (and totally on-trend! ), but I think that rainbow-colored spots perfectly illustrate the idea of being different. Throughout my life, my desire to fit in with the popular kids (whether they were high school classmates or big-name bloggers) has been at odds with my desire to stand out from the crowd. In my 30s, I’m finally starting to understand that, in a world of sameness, people are often attracted to those who are different, who are brave enough to speak their minds or go against the conventional ways of doing things. Take blogging, for example. I’ve often felt jealous of the success of other bloggers, many of whom share a similar aesthetic, tone, or point of view. (Have you noticed that many bloggers nowadays sound alike?) In the past, I thought the way to attract readers was to emulate those popular blogs; however, I now understand that I’d be doing myself a huge disservice by trying to copy their style. Why? Because there would be no reason for you want to read my copycat blog when you could read their original versions. In order for my blog to earn a spot in your RSS reader, it needs to offer something different. And, yes, I’m still working on that. So this month’s Desktop Design is a reminder to showcase your individuality, to feel confident in expressing your unique perspective and opinions. But the idea of being irreplaceable is not limited to blogging. I think it can be applied to all aspects of one’s life, from work to friendships. What do you think? PS: The polka dots also remind me of this book , a childhood favorite of mine and now one of Levi’s go-to reads. 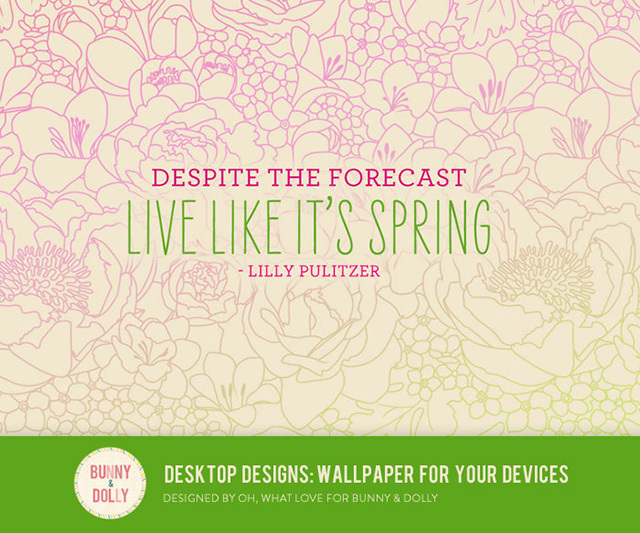 I am SO excited to introduce Bunny & Dolly’s newest series, Desktop Designs: Wallpaper for Your Devices. Each month I’ll be sharing a new downloadable wallpaper featuring words meant to inspire and motivate. 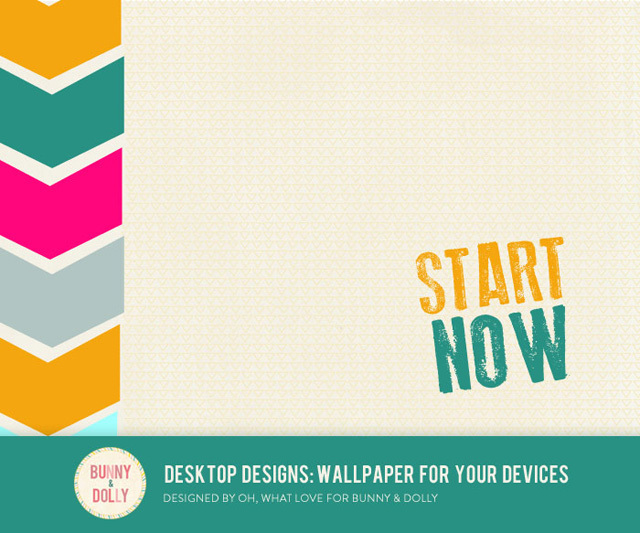 For Bunny & Dolly’s first monthly desktop wallpaper, I chose the phrase “start now.” Sound familiar? Start now happens to be my theme for 2013, and I thought it was a fitting message to kick off the series. While I like to think I have an eye for design, I’ll be the first to admit that I have zero artistic ability. So I enlisted the help of Mariah Danielsen of Oh,What Love Studios to bring on the pretty because we have have a similar aesthetic (aka, we both love Anthropologie). Although we started this collaboration several weeks ago, I was thrilled to be able to meet Mariah in person at Alt. Let me tell you, she’s just as sweet and stylish as her site suggests. Now here’s the really exciting part! Next month’s Desktop Designs is going to be created by you! Well, sort of. Mariah will be doing the graphics, but I want you to provide the inspirational phrase or quote. In the comments below, share with us the words that motivate you. It could be anything from a slogan to a line of prose. At the end of the month, I’ll pick my favorite to be used in March’s downloadable wallpaper. Psst… If you’ve never left a comment on Bunny & Dolly before, why not start now? PS: If you need a different size screen resolution, please let me know. 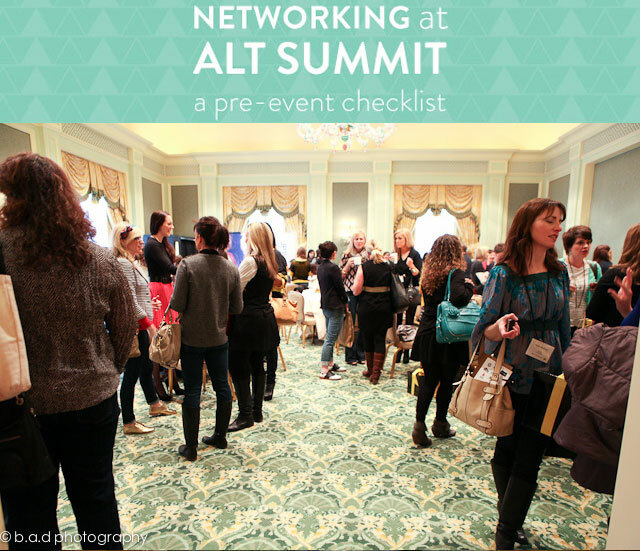 The hashtag #altsummit was buzzing on Twitter and Instagram this weekend with chatter about packing for Alt Summit. Attendees like myself were asking questions about what to wear, sharing links to packing lists, and snapping photos of possible outfits. If there was ever an occasion to dress to impress, it would be a blogging conference like Alt Summit. However, transforming the Grand America Hotel into a real world catwalk is not Alt’s primary intention. Alt Summit exists to bring together design and lifestyle bloggers to learn and share ideas and to connect with potential sponsors. For an introvert like myself, just the thought of networking makes my hands sweaty. So I called up Andrea Nierenberg of The Nierenberg Group for a pep talk. She may be the queen of networking, but she actually considers herself to be an introvert–which gives me great hope! Andrea graciously offered networking tips to help me prepare for three days of connecting with bloggers and brands.